Love the movie Little Shop of Horrors? Love prizes for dressed character? Then you’ll love watching Little Shop of Horrors at The Grand in Clapham. 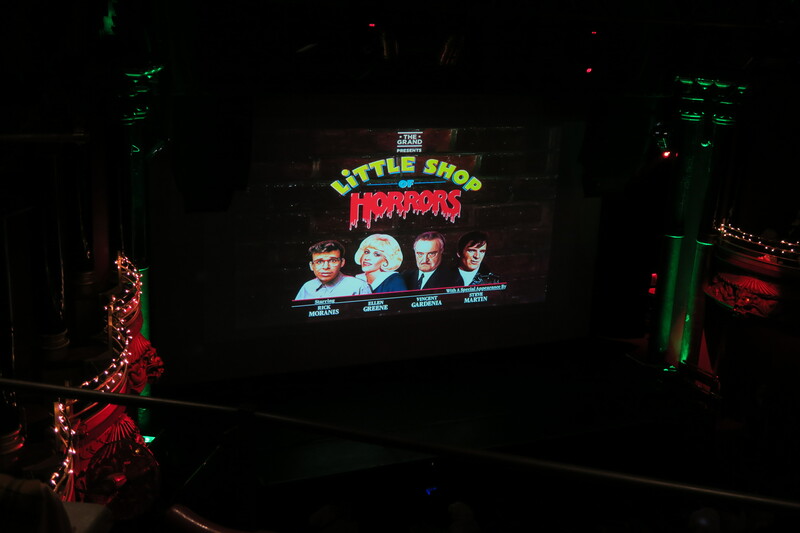 The Grand invited us of Love Pop Ups London to a night to relive Little Shop of Horrors. So we joint many other Little Shop of Horror fans from so many Seymours, Orin’s, Audreys and Audrey II’s. There was mass sing-alongs to “Skid Row” and “Suddenly Seymour” with so much more. There was even prizes for the best dressed Audrey, Audrey II, Seymour and Orin. There was also themed florist cocktails and a little shots of horrors. Plus so many hotdogs, nachos and popcorn. This was for one night only but The Grand is always putting on unique events to celebrate classic movies such as Little Shop of Horrors. To discover more about The Grand’s upcoming shows and events click here. Love classic movies and love to sign then The Grand to see any movie is a must. A sing along film on a Saturday night in Clapham what is not to like. We were treated to a really nice area, with a bottle of prosecco and a great view of the screen. I liked that despite how big the grand is, you were able to see the screen clearly and that the supply of popcorn was never ending. The movie was great for singing along and I liked how carefree and relaxed the atmosphere was. There was even a photo booth for the all important snaps. I would definitely say if you’re at a loose end on the weekend and enjoy movies, then it’s worth checking out the Grand. Big cinema experience with the in house party experience? Then check out The Grand at Clapham. Want to know more..?